Be sure to visit the Tech Stuff page for links to some popular online services that can enhance your church communication and reach. A church website is a vital tool to communicate and disseminate information not only to members, but to the general public. Here in Hawai'i, many of our churches are in busy vacation destination sites, and visiting Episcopalians rely on the internet to track down a church they can attend while in the islands. But today's websites are much more than just a place to read about service times and events-- it's a place where live feeds, blogs, videos, fundraising and event registrations can take place. If you need help creating a website or updating your current site, e-mail Communications. We recommend using Weebly which makes putting together a great website quick and easy! Communication is evangelism – and the Office of Communication has many resources to help evangelize the Good News and engage communities in the work of the Episcopal Church. These resources include tools to assist with building awareness of your work, gaining a stronger voice on topics that you care most about, and enhancing perceptions among influential, highly-engaged groups inside and outside the Church. Included are useful materials, such as forms to develop key messages and create local news media coverage, and a step-by-step guide on how to place your leaders on local opinion pages and websites to gain community leader buy-in on topics important to you. You’ll also find information about other tools, help and counsel available, often at no cost, through the Office of Communication. To visit the Toolkit webpage, click HERE. There is no denying that social media outlets have become the quickest format for "getting the word out", and many churches in the Diocese have pages on Facebook including the Diocese of Hawai'i. The Diocese also has a youth Facebook page, and so does the Bishop! The Episcopal Church has a number of different Facebook pages as well. Twitter and Instagram (for younger audiences) has also been used by many tech-savvy clergy to keep their members in the loop. Explore the different options and opportunities to engage not only your members, but to reach out to visitors and strangers who may be seeking a church home. The Episcopal Church shield logos featuring the new type treatments created in 2011, are available at the Episcopal Church website HERE. 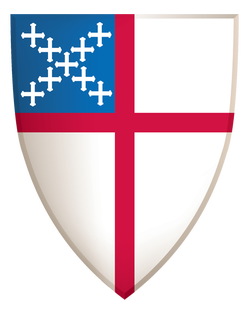 The new (2014) graphic guidelines outlining important details for the use of the Episcopal Church shield and logos, including fonts, color palette, use of the shield, and important designs information are available as a downloadable pdf file HERE. The Episcopal Church Welcomes You signs are available for purchase from the Episcopal Marketplace.